Download "Learning Objectives. Required Resources. Tasks. Deliverables"
1 Fleet Modeling 10 Purpose This activity introduces you to the Vehicle Routing Problem (VRP) and fleet modeling through the use of a previously developed model. Using the model, you will explore the relationships between costs, emissions, and customer service. Learning Objectives To understand basic concept of vehicle routing and the VRP. To be introduced to and use a modeling tool. To identify tradeoffs between costs, emissions, and customer service within fleet routing. 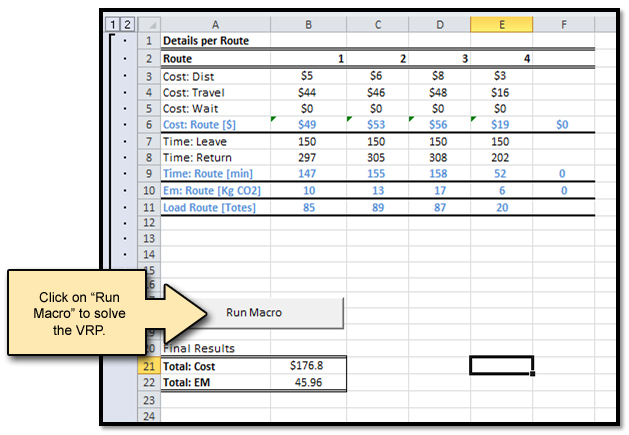 Required Resources Fleet Model (excel file with macro) Tutorial Tasks Complete the tutorial. Compare and discuss your answers to the questions within the tutorial with those students around you. Deliverables Completed tutorial. 2 Our Problem In the city of Seattle, a grocery delivery company receives grocery orders from their customers every day. The customers choose products and a delivery time window online. Based on this information, the company packs the orders in totes (plastic containers) and decides on the routing and thus the more precise time when each customer will be visited. Such routing and scheduling decisions are made by a vehicle routing model which minimizes cost based on information about Seattle s road network, fleet s characteristics, customer s location and demand. In this activity, you are provided with a version of the vehicle routing model (a macro-enabled excel file) and will determine routing and scheduling for a particular fleet and customer demands. Using information about time windows, customer s demand, and fleet characteristics, you will calculate the routing and scheduling for a subset of this company s customers and observe how changes in inputs alter outcomes. The model is explained in more detail. Key Concepts Vehicle Routing Problem An optimization problem seeking to service a number of customers with a fleet of vehicles. Often the routing involves delivering goods from a central location, or depot, to customers who have placed orders. The problem can be optimized on numerous objectives, but is often optimized to minimize cost. OD (Origin-Destination) Matrix Matrix providing the distances between all pairs of customers. In this activity, distance is in units of miles. Time Window Times between customers can be visited or served. In this activity, time is in units of minutes (after 12:00 midnight). Service Time Time required to load and unload goods for a customer. In this activity, time is in units of minutes. Fleet Vehicles operated by a company. These vehicles can have similar (homogeneous fleet) or different attributes (heterogeneous fleet). Capacity Maximum amount of goods that can be transported by a single vehicle. Capacity can be measured in different ways depending on the type of vehicle. Examples of units are number of totes, kilograms, liters, etc. In this activity, capacity is in units of totes. Emission Factors Rate for emissions per unit of distance. Emissions can be CO 2, NO x, PM, etc.. In this activity, emissions are in units of CO 2 /mile. Costs Two components: (1) a distance-based cost which includes operational costs to driving the vehicle, such as fuel, tire replacement, maintenance, and repair, and (2) a time-based cost which is composed of drivers hourly wages. 3 1. Using the Model to Solve the BASE CASE 1.1. Open the model Activity 10: Fleet Modeling Files needed for this activity are found on the class website. Save the file Activity Base Case.xlsm on either the desktop or a flash drive. Open the file Model Inputs The BASE CASE inputs are already entered into the model. The input sheets within the model are labeled with green tabs. As seen below, light green tabs indicate inputs related to the network and customers, and dark green tabs indicate inputs related to the fleet. Ignore any other uncolored tabs as these sheets are only used for internal calculations. In more detail, each of these sheets has the following information (information about each sheet can also be found by clicking the button located on the sheet) : Dist: OD matrix for all customer locations (57 total) and the central depot. The origins and destinations are noted in both row 60 and column BH. The values within the matrix are the distances (in miles) between any two locations. The distance between a customer and itself is a large number to discourage the model to visit the same customer on consecutive stops. Start: Beginning of the time window when a customer can be served (in minutes after midnight). The start time is in column A while the locations are noted in column B. End: End of the time window when a customer can be served (in minutes after midnight). The end time is in column A while the locations are noted in column B. 4 Service: Service time required per customer (in minutes). The service time is in column A while the locations are noted in column B. Demand: The number of totes to be delivered to each customer. No goods are delivered to the depot. The demand is in column A while the locations are noted in column B. Capacity: The capacity (in totes) of each vehicle in the fleet. There are 5 vehicles in the fleet. Em: The emissions factors (in kg CO 2 /mile) for each vehicle at 15 mph and 40 mph. Costin: The cost per mile and per minute for each of the vehicles in the fleet. Truckin: summary table of all inputs related to vehicles. The values in the worksheet are linked from the values in other input worksheets (thus you will never need to make changes to this sheet). While you will not make changes to the inputs of the model when we examine the base case, you will be asked to change the inputs in the model later in the activity. QUESTIONS 1.2 How far does a vehicle have to travel to get from customer 18 to customer 47? What about when the vehicle travels from customer 47 to customer 18? Why might these distances be different? Between what times customer 10 can be served? How much time is needed to deliver customer 14 s totes? What are the capacities of each individual vehicle in the fleet? What are the emissions factors for the vehicles in the fleet? Do the vehicles in the fleet produce more emissions when driving fast or slow? Based on the capacities and emissions factors for the fleet, do you think this is a homogenous or heterogeneous fleet? What is the total cost if TRUCK 1 drives 10 miles in 15 minutes? 5 1.3 Running the Model Return to the home sheet within the file. Activity 10: Fleet Modeling Before you can run the model, you may need to enable macros. Click on the options button next to the Security Warning, just below the excel toolbars. In the pop up box, click to enable the macro. To run the model once the macro has been enabled, click in the Run Macro button. The file will start flashing and values will begin populating the cells. Don t worry, this is normal! 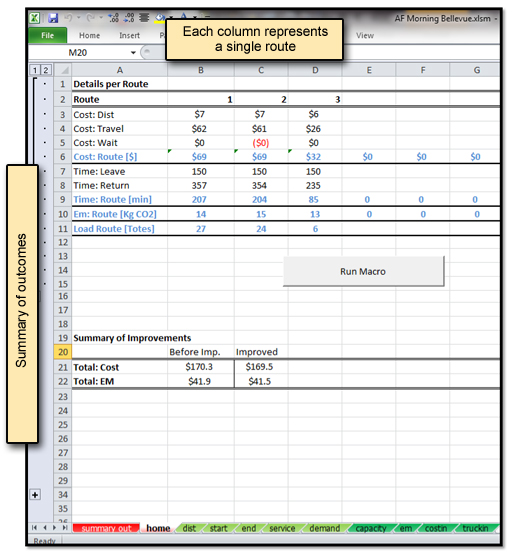 6 The macro will run automatically and print the resulting problem solution on the summary out and home sheets. 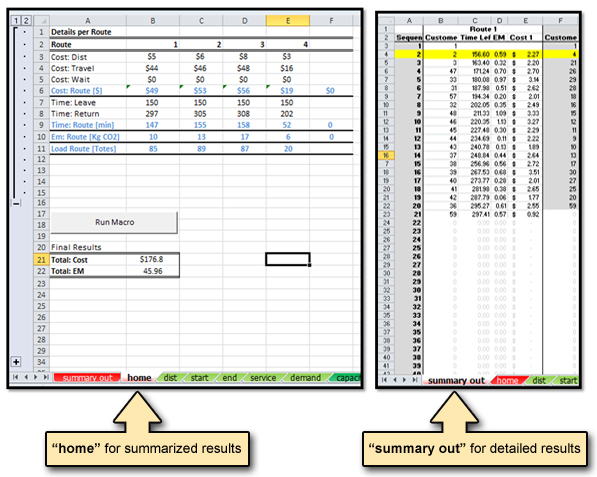 The home sheets summarizes of the problem solution at a route level, while the summary out provides detailed results for each of the routes at vehicle and customer level. 1.4 Understanding the Outputs Click on the home sheet. You can find a summary of the results at the route level in this sheet. Additionally, you can see a brief summary of the total cost and CO 2 emissions for all routes below the Run Macro button.. This summary includes information on cost, travel time, emissions, and load for each of the route as explained below. Each column contains information for a single route. Each route is labeled with consecutive numbers (starting at 1) in the second line of the sheet: Cost: Dist: operational cost of the route calculated using the per mile costs. Cost: Travel: operational cost of the route calculated using the per minute costs (when driver is travelling or serving customers). Cost: Wait: operational cost of the route calculated using the per minute costs (when driver is waiting to serve a customer due to time window restrictions) Cost: Route: total operational cost for a route. This is the sum of the three costs listed above. Time: Leave: time when a vehicle travelling a route leaves the depot (in minutes after midnight). 7 Time: Return: time when a vehicle travelling a route returns to the depot (in minutes after midnight). Time: Route [min]: total minutes a vehicle uses to service a route (Time Return minus Time Leave). Em: Route [Kg CO2]: total CO 2 emissions for each route measured in kilograms of CO 2. Load Route [Totes]: total number of totes delivered by a truck in a single route. The total cost and emissions produced to service all customers is also displayed on this sheet in cells B21 and B22. 8 Click on the summary out sheet. 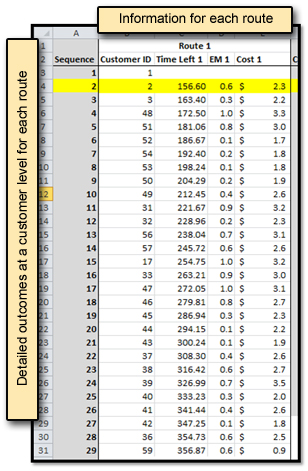 You can find a detailed description of the results at a customer and route level in this sheet. In this sheet you can find information on customers sequence, time when a vehicle left a customer s house, and emissions and cost for consecutive visits as explained below. This information is grouped for each route as labeled in the first row. Sequence: unique column showing a consecutive sequence of numbers. Used to help to define relative order between customers in routes. Customer ID: customer number (1-59). Time Left: time (in minutes after midnight) when a vehicle leaves a customer location. EM: CO 2 emissions produced from traveling between this customer and the previous customer. Cost: total operation cost from traveling between this customer and the previous customer. QUESTIONS 1.4 How many routes/vehicles are used to service all the customers? What is the total cost and total emissions produced to service all customers? (Also fill this information into the chart on the last page of this activity) What time does the second truck leave the depot and what time does the second truck return to the depot? Which route is the most expensive? Which route has the highest CO2 emissions? What is the first customer visited in the third route? 1.5 Save the Model Run Save Activity Base Case.xlsm to the desktop or flash drive. 9 2. Using the Model to Examine a Heterogeneous Fleet The base case uses a homogeneous fleet (vehicles with same capacity, cost per mile, cost per minute, and emissions per mile). Now we will look at a heterogeneous fleet to solve the same problem. To do this, you will need to update the fleet inputs in the Excel sheet Rename and open the model Heterogeneous Fleet: Case 1 Open the original file (Activity Base Case.xlsm) and save it as Heterogeneous Fleet Scenario 1.xlsm. Note that you must save the file as an Excel Macro-Enabled Workbook (*.xlsm) file. 2.2 Change fleet input data Change the input values for the fleet using the information provided in the table below. Truck Capacity 15mph 40mph Cost/mile Cost/min Running the model Return to the home sheet and click on the Run Macro button to solve the new heterogeneous fleet problem 2.4 Understanding the output As before, a summary of the routes can be found in the home sheet and detailed routings at a routelevel are printed in the summary out sheet. Use this information to answer the following questions. Additionally fill this information into the chart on the last page of this activity. QUESTIONS 2.4 Are more or less trucks needed in this scenario when compared to the base case? Why? Are the total emissions higher or lower than the base case emissions? Why? Why do the costs per minute values not change? 2.5 Save the Model Run Save Heterogeneous Fleet Scenario 1.xlsm to the desktop or flash drive. 10 2.6. Rename and open the model Heterogeneous Fleet: Case 2 Save (as) the previously opened file as Heterogeneous Fleet Scenario 2.xlsm. Note that you must save the file as an Excel Macro-Enabled Workbook (*.xlsm) file. 2.7 Change fleet input data The model assigns customers to vehicles in the order they are presented in the input, therefore changing the order of vehicles within the model will change the results. Invert the order of the vehicles as seen in the table below. Do this manually to avoid problems with how the cells are linked Truck Capacity 15mph 40mph Cost/mile Cost/min Running the model Return to the home sheet and click on the Run Macro button to solve the new heterogeneous fleet problem 2.9 Understanding the output As before, a summary of the routes can be found in the home sheet and detailed routings at a routelevel are printed in the summary out sheet. Use this information to answer the following questions. Additionally fill this information into the chart on the last page of this activity. QUESTIONS 2.9 Summarize the differences in the results using the two different heterogeneous fleet orderings. Compare number of vehicles used, emissions, and cost. Are the above results what you would expect? Explain how the ordering of vehicles impacts overall cost and emissions. Based on the results of each scenario, if a fleet manager has a heterogeneous fleet and wanted to minimize emissions, how would you tell him/her to order trucks? Does this order also minimize cost? 13 QUESTIONS 3.8 (con t) Scenario 1: Customers get to choose within what time window their delivery occurs Scenario 2: Customers are assigned to a time window based on their location. Scenario 1 or 2 (circle one) What is the trade-off in terms of cost and emissions between each of the scenarios modeled? What is the trade-off in terms of customer service between each of the scenarios modeled? 14 Final Comparison Complete the table below with the activity results. Base Case Heterogeneous Fleet 1 Heterogeneous Fleet 2 Time Window 1 Time Window 2 Total Cost Total Emissions Using the data and results of this activity, make 3 conclusions regarding urban vehicle routing. EXHIBIT B APPLICATION FOR PAYMENT EXHIBIT B CONTINUATION SHEET PAYMENT PROCEDURES AND FORMS. MEDCO Construction L.L.C. Welcome to the NEW Esso Fleet Online Designed to make your life easier and save you money. EXCEL DATA FILE UPLOAD The Oregon Fuels Tax System allows data to be entered manually into each online schedule. Large amounts of data can be uploaded through the XML process (requires specific software).